Well, my hopes of all the issues and bugs being worked out and buying a kit that was the product of all the revisions being incorporated have been dashed. Van’s released a Service Bulletin (SM 14-1-31) that requires me to do some more work on the HS. It appears that some cracks are forming in the forward spar interface with the ribs and skins and doublers are being called for now. Granted, I am glad I can comply now rather than later, but still a bummer as this SB requires some tear down of completed parts. Fortunately, it is much easier to complete on the bench than on the plane. If you look in the upper right corner of this drawing snippet, the relief notches are being found with cracks. This is likely due to the relief notch not being smooth and the stresses put here in flight. While they are voluntary according to the FAA, I don’t want to chance anything in the future, so I am going to comply now, or as soon as the parts arrive. I have been really busy of late with other things that have kept me from building. Nothing terribly interesting, but things. So they stopped over and checked out the tail and the spar work thus far. I was pleased by his encouraging words and praise. Seems I am doing a decent job at building, so that is a boost. I also found out I have a ride to Oshkosh this year. A fellow CAP Pilot and RV-6 owner graciously offered his empty seat to me. Thanks Kent! The experience will certainly give me some good exposure to a tail dragger and the RV-6/7 feel/handling. I am super excited! I love this EAA/RV community! I was eager to get home tonight and finish the last couple of items on the elevators. 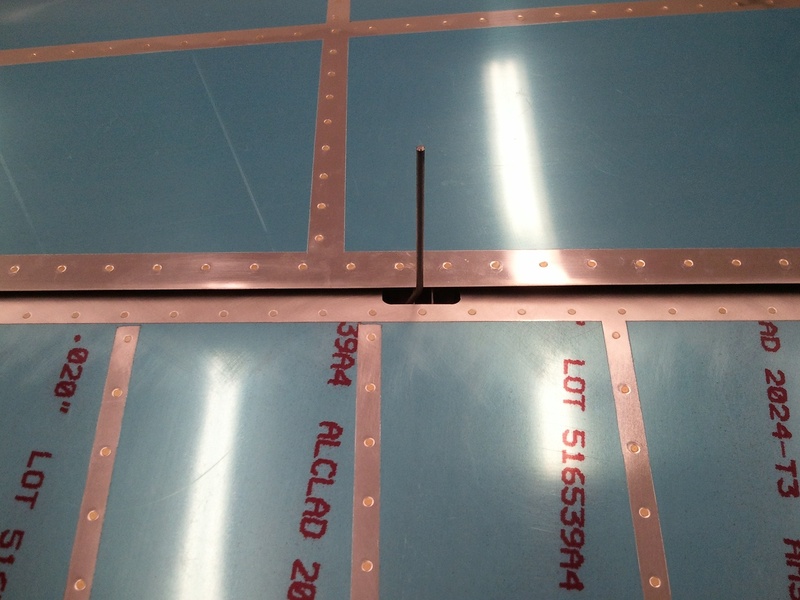 After all, these are the only items left on the entire Empennage as far as construction goes. I cut and filed the last two HS skin clearances for the counterbalance arms on the top of the skins. The elevators can now swing free top to bottom. It was cool to just stand there and see them move through the travel range. They look like airplane parts for sure. At this point, drilling the horns for the center pivot bolt is the only step that remains. Last weekend, I placed my order with McMaster-Carr for the requisite 8491A784 drill bushing to assist in tackling the drilling of the horns for the pivot bearing bolt holes. It arrived this last Wednesday. It was not cheap. It appears to come slightly oversize for the 1/4″ bolt hole in the bearing. Actually, I think the bearing is slightly undersized. To fit the bushing inside the bearing, I had to put the busing in my drill press and simply sand it down little by little until it slides into the bearing. Above you can see the bushing in place in the bearing and my #40 drill bit inserted. 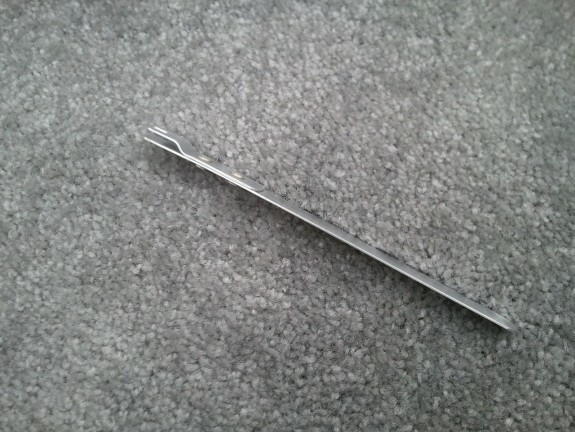 This centered the drill bit and kept the bit from wandering. I clamped the right elevator in trail of the HS and committed to the hole. The bit drilled through pretty quick. I then opened the hole up with a #12 bit and then finished with my step bit to a finished size of 1/4″. I repeated the process on the left elevator. Above is the finished result on the left elevator horn. All in all a pretty clean hole. I then installed the elevators back on the HS and to my delight, the two horns and the bearing all lined up and I was able to get the bolt in and some spacer washers in place per the plans. 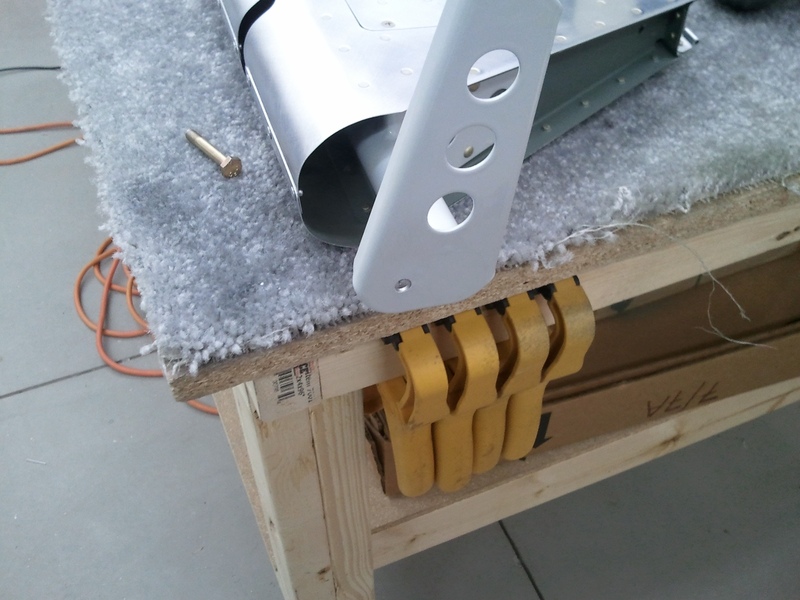 I then replaced all the temporary hinge pins with the bolts that go in each hinge point and tested the travel again. No binding from top to bottom travel. I was also enamored with the smoothness of the travel. Silky. 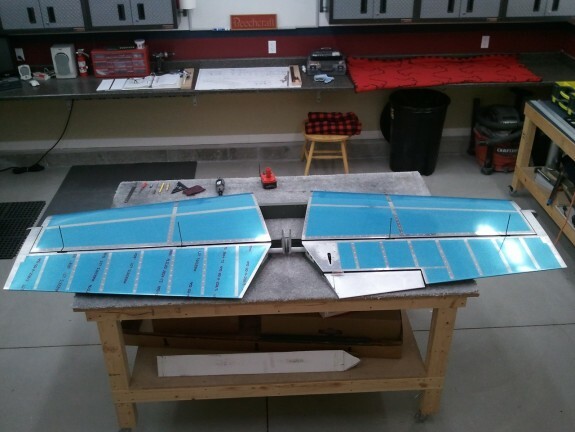 As far as major construction goes, the Empennage is COMPLETE! 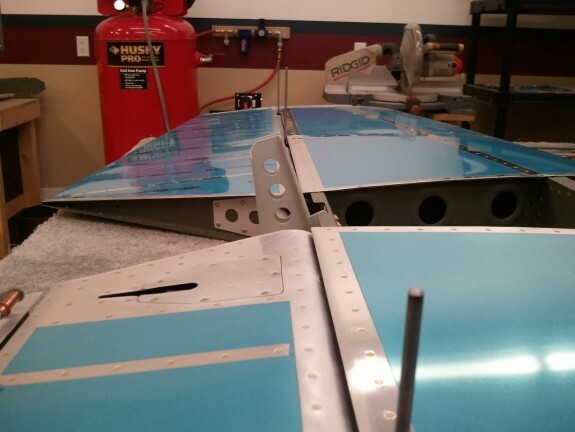 Only items that remain are the fiberglass tips on the Empennage parts. These will wait until later as they can tear up tools because of the composite nature. Van’s suggests that you wait, though not required, until you are doing more fiberglass work later on. Now I need to find a way to safely store these assemblies in the shop to get them out of the way and save them from damage. Time to move on to the WINGS!!!! 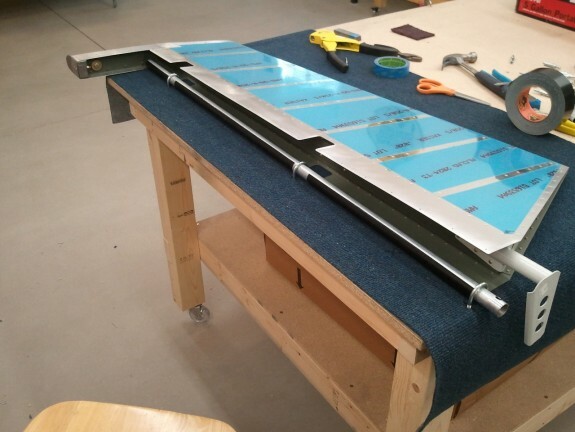 After work, and my requisite hug and kiss I give the wife to say hello, I ran out to the shop to tackle another small task on the Horizontal Stabilizer. I was able to get the left HS skin notch for the counterbalance cut out and filed. I then got the call for dinner and had to put the tools down. I love having a dedicated space to build. Only one more step on the underside of the HS to go. Once dinner and Family Night stuff was over, I headed out to take care of that last task. The lower flange of the HS rear spar interferes with the full deflection of the elevator horns. To solve this problem, you need to notch the flange to clear the horns. I am sure that it would have been possible to do this step earlier during the construction of the HS, but the manual has you wait until the elevators are mounted to do it. While the elevators were mounted on the HS, I made a mark on the spar flange in line with the outboard edge of the horns. I then added 1/8″ to that to give the horns clearance along the sides. I had to remove the center bearing assembly that I had previously final torqued the bolts, but that was no big deal. 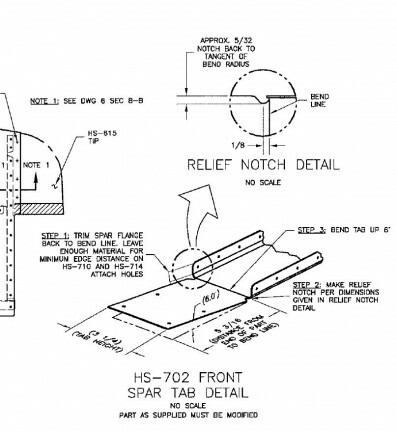 I then masked over the spar reinforcement bars as the plans explicitly say, DO NOT REMOVE ANY MATERIAL FROM THE HS-609PP! 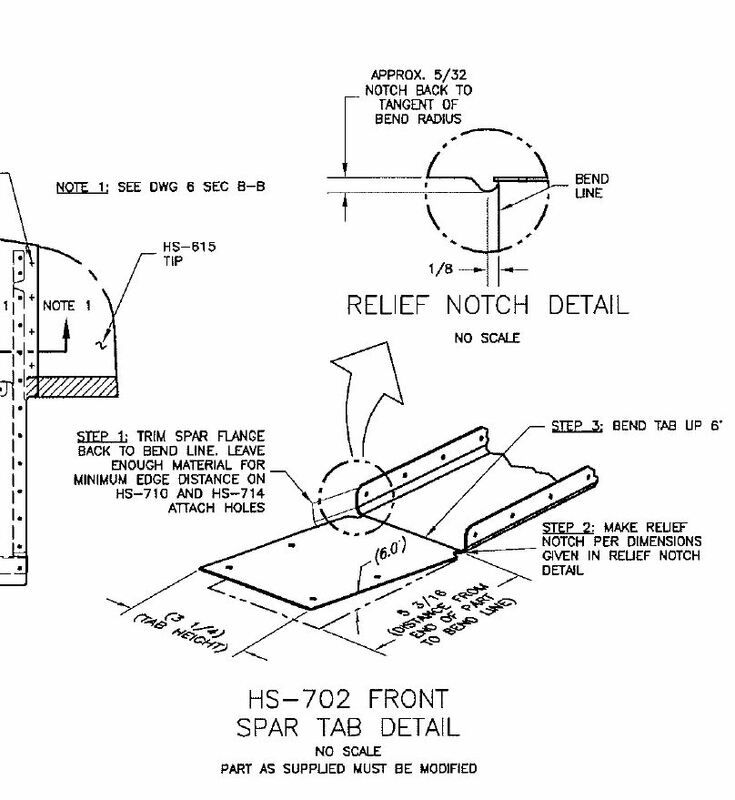 I looked at the plans and basically notched the flange flush with the reinforcing HS-609PP bars inside the spar. I figure the lower travel stop that will more than likely stop the elevator horns from ever hitting this flange now so I have good clearance and clean lines. I also noted as I was completing this step the obvious increase in my expected level of perfection. When I had started the HS, I rounded the corners of the spar where they met in the middle. The corners were not even close in shape though just fine. As I looked at the other parts in progression of completion, I noticed my attention to detail has improved. Perhaps Van, in his wisdom, knew this would naturally occur and left these last tasks where they are to create better results through natural progression. The accuracy of this kit keeps shining through no matter the mistakes I have made. Once the center notch was complete, I remounted both elevators to the HS. To my delight, the horns appear to be very close in orientation to one another. Some other builders, and even the plans, note that these may not be exact as the manufacturing process is not perfect on the horn weldements. Vans has either improved this, or I am lucky, as mine are pretty darn close as you can see in the above picture. At this point, the spar/skin trimming on the underside of the tail is complete. All that remains is the counterbalance skin clearance portions of the upper side, drilling the center bearing/horn interface, and the fiberglass tips. I may wait to drill the horns when the tail is mounted to the fuselage, but the tips are definitely waiting until the tail is on the rest of the plane per the advice of many builders. Time will ultimately tell. Stay tuned for the official “Tail Complete” announcement to hopefully come later this week. 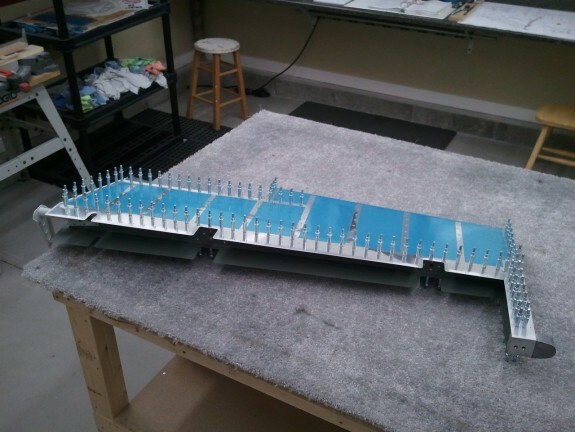 It was time to mount the elevators to the horizontal stabilizer. However, there is a conflict with the skin and the counterbalance arms at the moment, which prevents one from being able to deflect the elevator to open the areas where the bolts are to go. 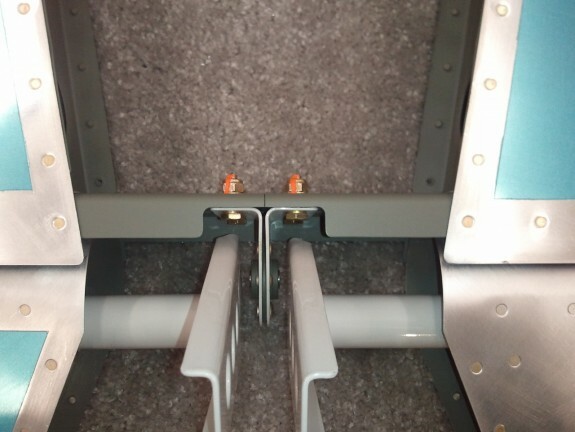 There is simply not enough room to get a bolt in the hinge and have the elevator in line with the horizontal stabilizer. So what is one to do? 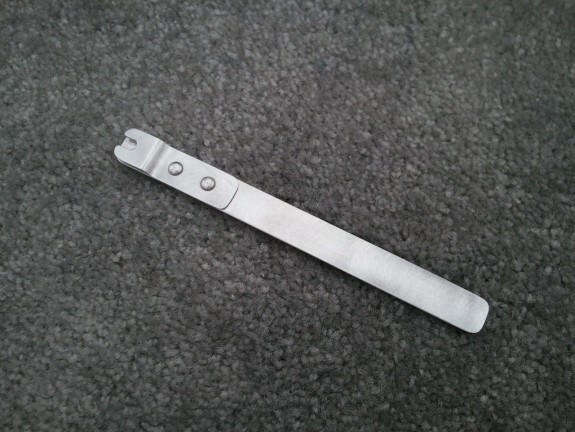 I had seen from some of the tool manufactures, tools they called hinge alignment pins. They were pricey to me. After all, they were simply steel rods the diameter of the bolts bent to look like landing gear struts for an RC airplane. So rather than buy the tools, wait for them to arrive, I went to Lowe’s Aviation Supply and bought a 3/16″ rod from the misc metal bin. Once I got home, I simply smoothed the ends and bent them to a similar shape in my vise. I think it cost me all of about $2.50 or so. I made two, one for each hinge point per elevator. Here you see the pin in place in the hinge of the elevator/horizontal stabilizer interface. They slip into the hinge points easily and allowed me to slide the counterbalance arm into the skin at the tips in preparation for the next step. As you can see, with the elevator in trail of the stabilizer, there is not much room for getting fingers in to install the final bolt. With the alignment pins, you do not need to worry about it. One caution, do not deflect the surface towards the side that the pins are installed. 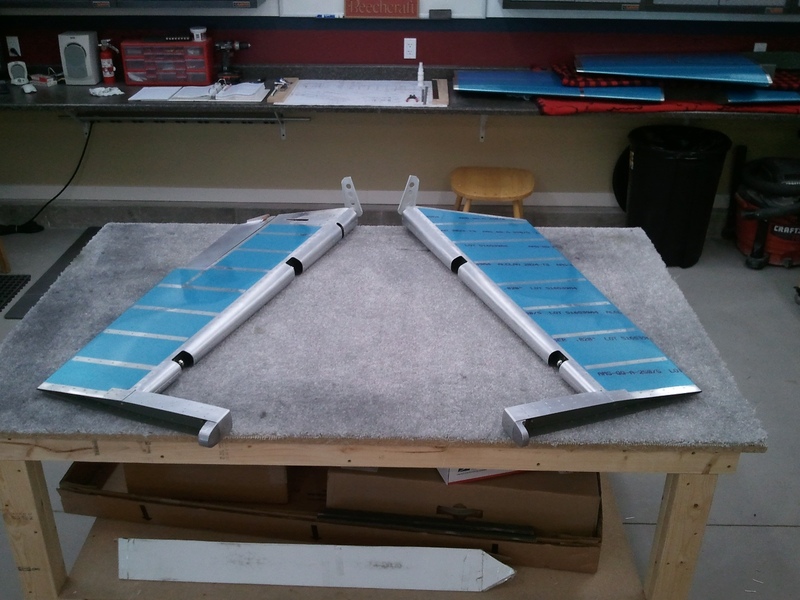 You could sandwich them in the openings and create a nice pucker in the elevator and stabilizer skins/spars. That would ruin your day. 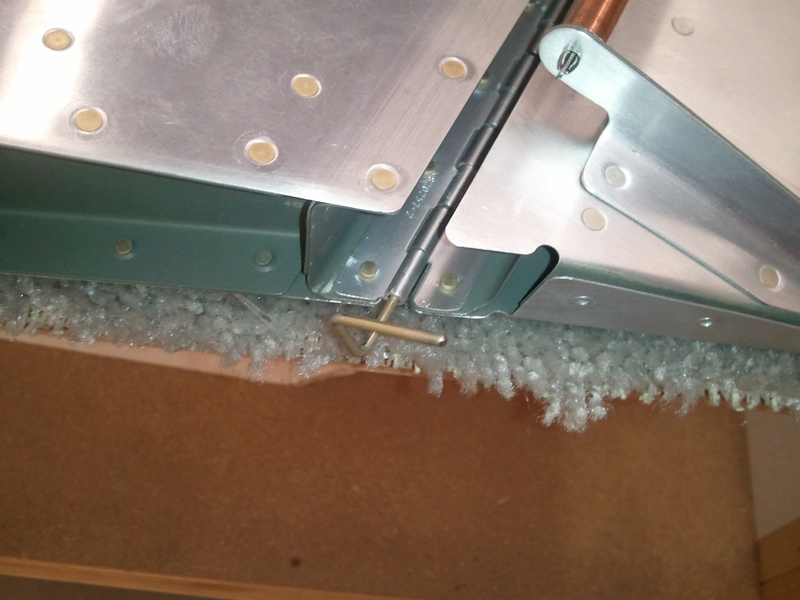 Once you can fully deflect the surface to open up the hinge locations, it is still difficult to insert the bolts into the hinge areas. I was reading the 27 Years of the RVator articles and came across this little jewel being described. Tool suppliers also sell something similar, but it looked simple enough to replicate as well. I wish I had done it for the rudder when I installed it. I simply took some .040″ sheet stock from the Empennage Sheet bundle and fabricated a tongue depressor size stick from it. I then took a smaller piece and drilled a 3/16″ hole in the center. I then used my band saw and opened up from the edge to one side of the hole and made a “U” in it. I clamped it to the other piece and match drilled it. I then bent the “Z” bend in the smaller piece in my bench vise and then riveted the parts together with some AN470AD4-5’s. I think it took me all of 15 minutes to make but should easily save that amount of time installing the bolts into the hinge points. Slide in the bolt head in the opening and insert away! As hinted to above, one of the final tasks that you have to do on the elevators is notch the HS skin for the longer counter balance arms on the RV-7. I think that the RV-8, which has the same tail except for the counterbalances, shares this skin. Rather than make a die for stamping out a skin for specifically the RV-7, they leave this task to the builder. Here you can see the complete notch for one of the four areas where this trimming has to be done. Basically the skin is about an inch longer and overlaps the counter balance arm when you mount the elevator to the horizontal stab. Since my wife was out of town this weekend with her girlfriends scrapbooking, I was playing Mr. Mom. I was only able to get this one notch done. It was a good start and turned out pretty nice. 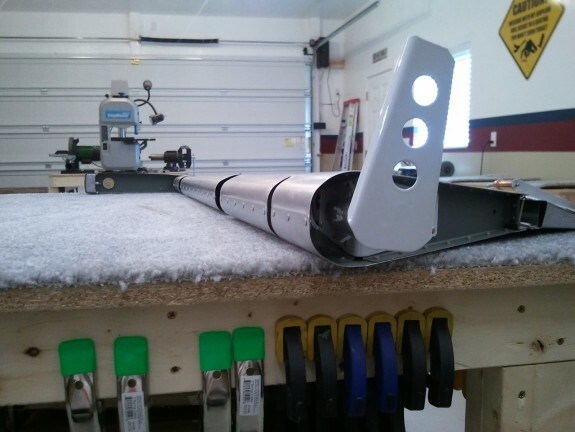 The goal was to get an 1/8″ clearance from the forward face of the counterbalance arm. The shadow on the curve in this picture makes it look bigger, but in person, it is spot on. I started with a notch on the bottom of the HS to start so if I messed it up, it would be hard to see when the plane is parked on the ramp. After complete, I hope they all turn out this good. Once this was done, I called it a day. All that is left is the other three corners and the notch in the center where the control horns go. Then I will set these parts aside and begin the wings!!! 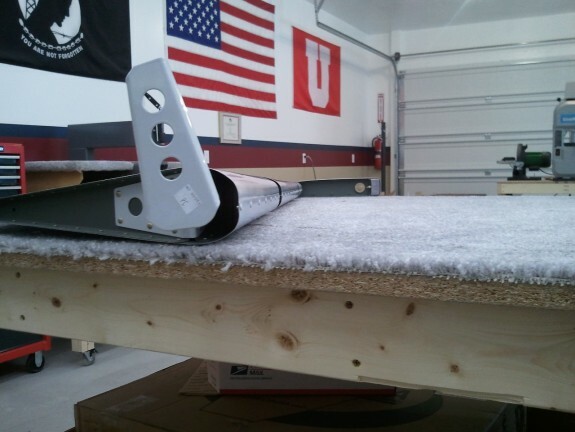 As I did with the Rudder, I took a tip from a builder over on VansAirforce.com where he used J-Bolts to hold a 3/4″ Electrical conduit to the table. This keeps the pipe close to the table and should make a nice radius. The other part of the setup is that you can drill the end of the pipe and insert a cross rod that can be used as a handle. Since you are not having to worry about holding the work to the table, you can use both hands on the handle. Supposedly you can also do all three sections of the roll at once. So I taped the skin to the pipe using “Gorilla” brand duct tape. I think this is the same stuff the USAF calls “100mph tape” because it sticks great. I then anchored the pipe to the bench using the J-Bolts. Once I was committed, I threw my 3/8″ steel handle through the holes I drilled in the end of the conduit, and then twisted away. At first I thought…heck, this isn’t all that bad. The bends seemed to be a nice radius and all three sections rolled together nicely. This may look OK! Once I removed the tape and conduit, I took a long look at the bend. The one problem I see is that I think the J-Bolt setup makes the conduit TOO effective. The radius seemed almost too tight. I massaged it as much as I could, but I learned on the rudder that too much massaging can make the problem worse in a hurry. I was reluctant to massage more than I could have for fear this may occur on the elevators. Once the bend was done, I simply pulled the skin ends together and clecod the overlap. There was some squeezing by hand to close them, but not a ton. I then match drilled, deburred, and clecod them, and then pop riveted the leading edges together. The above was the result for the left elevator. I may be hard on myself, but I wished they would have been a little more smooth in the radius. I think this again had to do with the conduit being too effective with the J-Bolts. Most that are not using the J-Bolts simply roll the edge by hand while holding the assembly to the bench. The J-Bolt eliminates the need to hold it down while rolling. In the future, if I have to do it again, I may just use a bigger diameter pipe/stick. Here you can see the right elevator roll. Here you can see the tighter radius again. I tried to massage it a little more subtle, but I was still afraid of making a bigger mess than solving. As it stands, the joints at the overlap are nice and tight with no noticeable puckering. I am pretty sure they will function just fine. 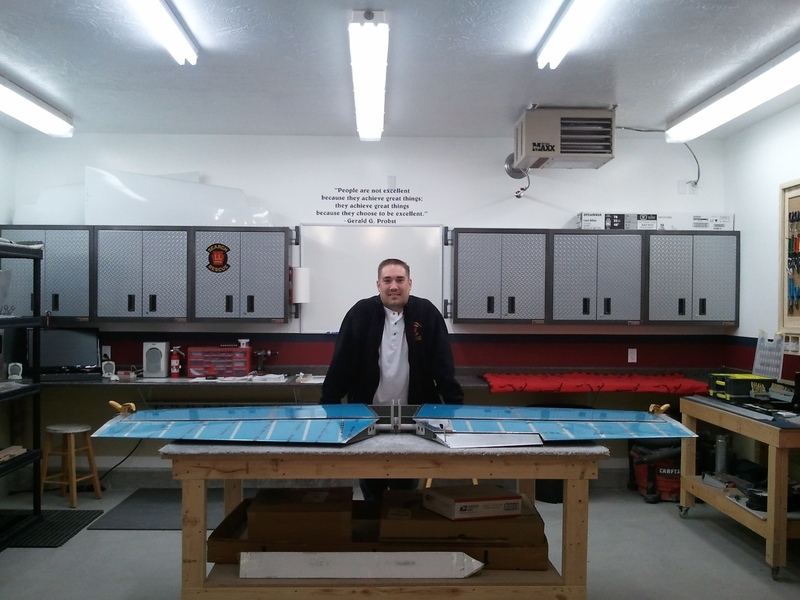 At the end of the build session, I walked out of the shop with two good looking elevators. This marks the end of the MAJOR portions of the Tail Kit. This is a big milestone. What’s left then? 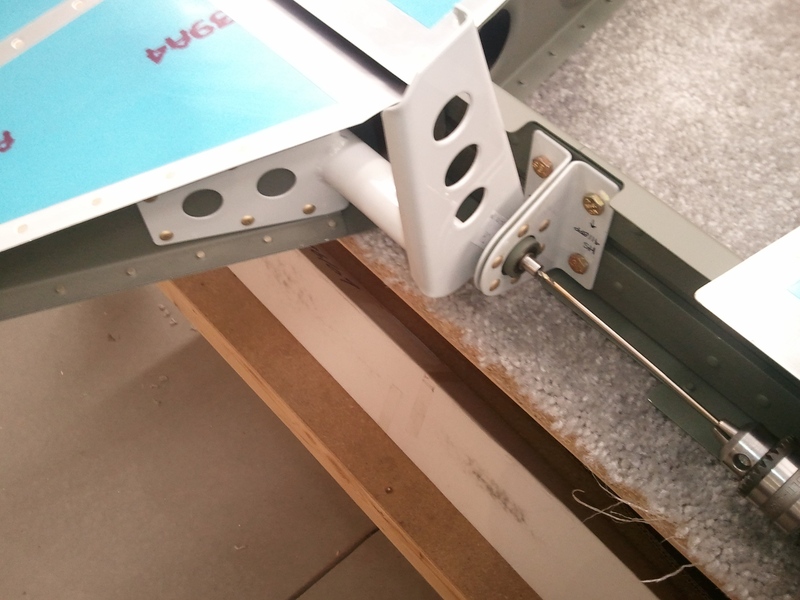 Mount Elevators to Horizontal Stabilizer and trim the lower flange of the HS-603PP to clear the elevator control horns for full down travel. Trim the HS-601PP skin to clear the counter balance arms. Drill the elevator control horns for the center pivot bearing and bolt. Once items 1-3 are done, I will store these parts away for safe storage and keeping and begin the WINGS! I will also call the empennage/tail complete! 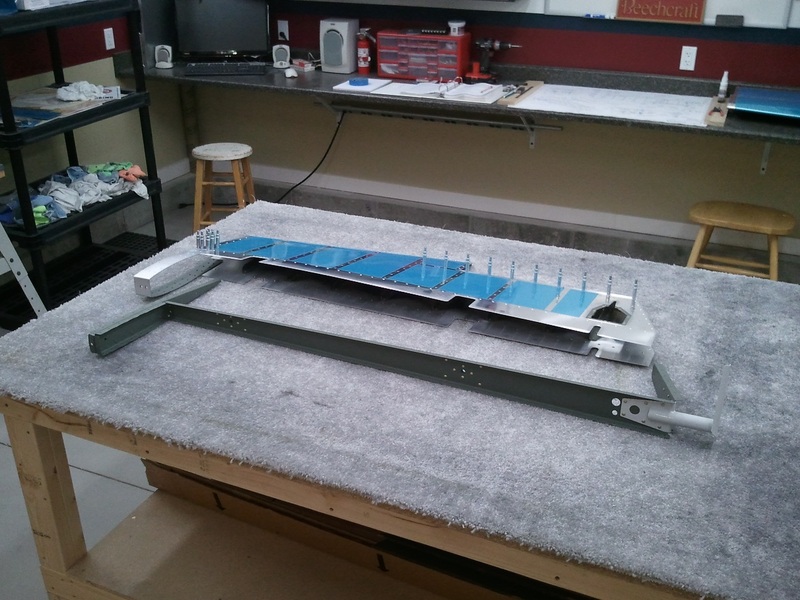 Once the new trim spar arrived, I was able to finish the skin prep and prime both the skin and the new trim spar. Once the primer dried, I then clecod the elevator back together. Here you can see it is all ready to be finished riveted. I should be able to reach most, if not all, with my squeezer. I love that tool. It makes fast work of rivets. Elevator Done, Trim Tab Hinge to Go! 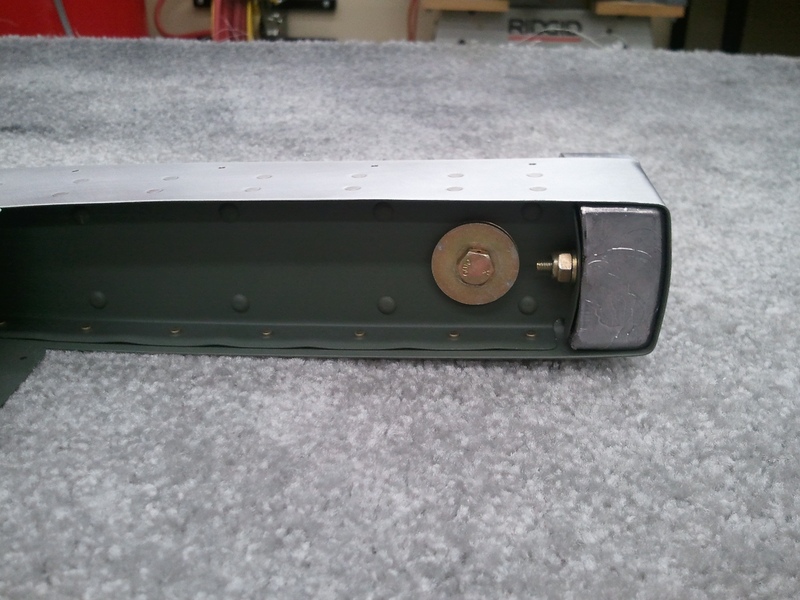 Here is the elevator riveted together. I think it took me all of about 30 minutes to get this far. 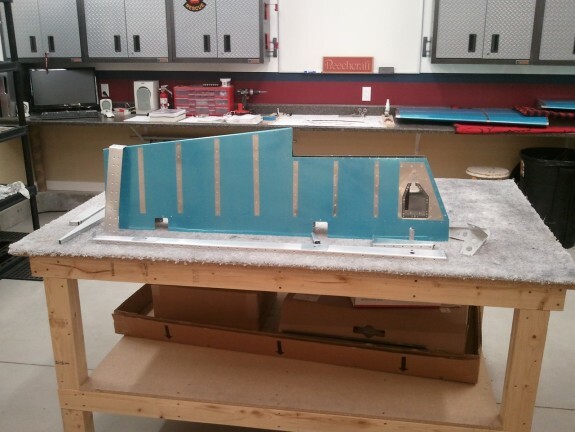 I also made the bends in the trim tab. I see now why people dread the left elevator. I had some real trouble keeping my bending blocks from slipping when trying to make the bends. Despite that fact, I think it turned out AOK. I scuffed up the skin in the process however. Since I am painting anyway, I figured I would simply scuff the whole tab now. Once the tab was match drilled and dimpled, I primed the inside and the faying surfaces of the end tabs and set it aside to dry. 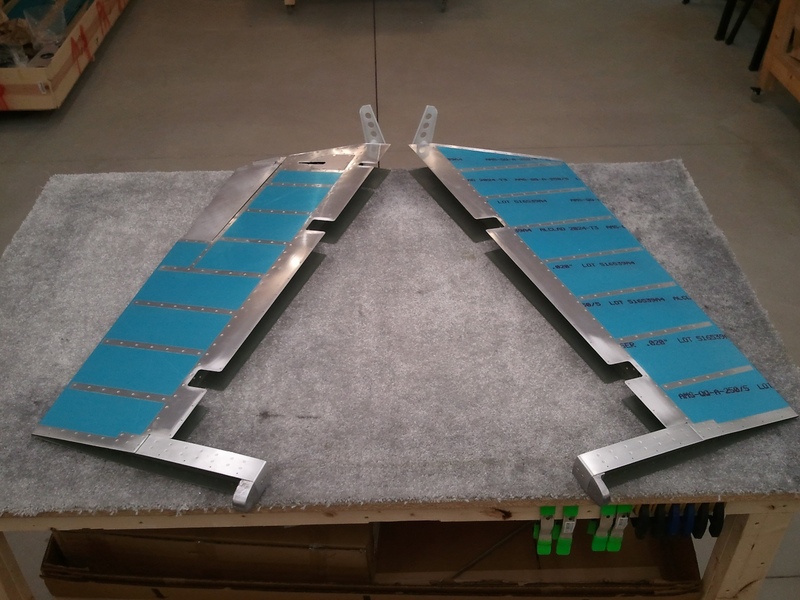 I then went to work fabricating the hinge for the tab an the elevator. I was excited at the progress I was making and went to town. I wanted to make sure that a complete barrel of the the elevator side would be located at the most inboard end. This also makes a complete barrel at the outboard end as well. I figured that this would limit any twisting forces that “could” occur, true or not. I marked the inboard edge of the trim tab side with the inboard edge of the trim tab. I did not however, do the same on the inboard side of the elevator half of the hinge. I simply cut it off flush with the last barrel and figured that would be good. I was wrong. I positioned the trim tab to the elevator and clamped on the hinge and match drilled both halves to the respective parts. The trim tab half went just fine. I clecod it on and went on with the elevator half. 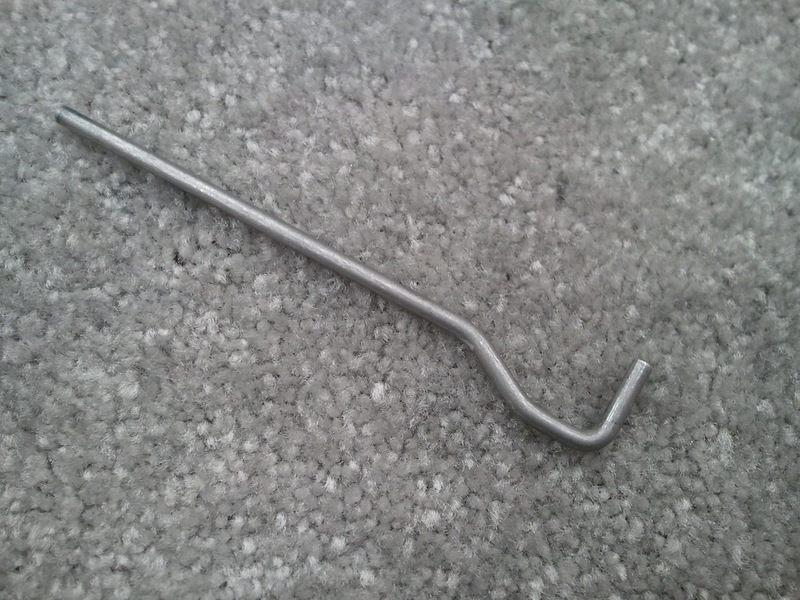 After match drilling the hinge and removing it, I saw something that concerned me a little. The most inboard hole was busting the 2Xdia edge distance and really (and I mean really) close to being inside of the 1.5Xdia edge distance rule. I consulted a few smarter folks and they said I would likely be OK to rivet it on as is. So I did. I finished the trim tab, inserted the hinge pin, stepped back and admired my nearly finished elevator. I typically do an after rivet smash inspection and looked again at the most inboard rivet on the elevator half. I just did not like it. It WAS too close to the edge. I also thought about where the most force would be transferred to the hinge. 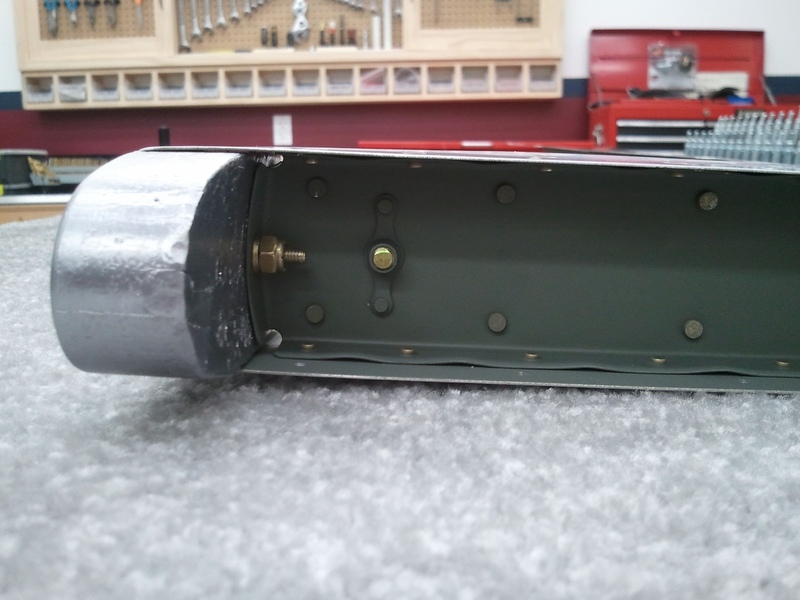 Since that is soooo close to where the trim servo actually applies the force to the trim tab, I bit the bullet and removed the elevator side hinge. I know, a whole row of rivets for one perceived mess up. I did not want the hinge to possibly tear out over time. After all, it is my plane and I needed it to be right, not close enough here. I now needed to replace the hinge. I first called around to fellow builders and A&P’s to see if they had any AN257-2 hinge. Turns out, it is not common. Not to mention, after some looking, the only AN257-2 hinge on the plane is right here. Guess it was time to order one. I checked Vans’s and Aircraft Spruce. Turns out for the same money and probably the same shipping, I could get 3 feet of #2 hinge from Aircraft Spruce over 18″ from Van’s. Both would arrive the same day, so order was placed at Aircraft Spruce. You can always use extra at the same cost. All in all, it was a great build day and a good learning experience. No pictures tonight. The new E-606PP trim spar arrived and I ran it out to the shop. I slid it into position, matched drilled it, and countersunk the upper holes. This time I used the same matched drilled backer and the countersunk holes looked great. I then dimpled the spar, the skin and slid in the assembled skeleton previously done, and clecoed it all together for fun. Hopefully this weekend I can prime the skin and spar and be able to get the elevator riveted together final. Then I can move on to the trim tab itself. Saturday came and it was a nice day to boot. I got some honey do’s done and then headed to the shop. Since prepping all the parts aside from the trim spar for primer, I knocked out spraying them. While the primer was drying, I took the time to remove the blue vinyl from the rivet lines on the skin, deburr it, and dimple all the holes except where the trim spar goes to be able to match drill it when it arrives. I then scuffed the skin for primer but the temp fell to far to shoot it. 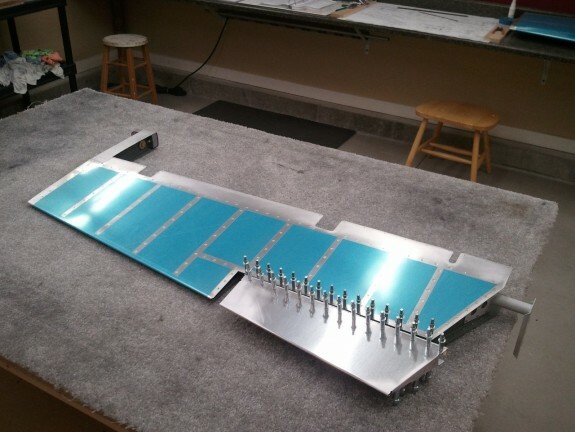 So I looked at the assembly instructions for the skeleton and determined I could start riveting the parts together without causing any trouble to getting the new E-606PP spar taken care of. The above shot is at the end of the building session. I was able to get the skeleton mostly complete. I love how it all lines up. You can also see my wire exit hole near the hole for the trim servo jack screw. Everything went straight forward as it could have. I love having the right tools for the job. If you have not purchased a longeron yoke for your squeezer…do it now! As for now, I am as far as the parts can take me on the elevator. I decided now that I have heat, I needed to get back to work on the plane. It has been a few months and life has been busy. Since the last build session concluded with the match drilling being mostly complete, and I keep a good list of where I am in the manual, starting up again was a breeze. I got back to work prepping the rear trim spar (E-606PP) for the trim tab. I needed to disassemble the spar from the skin and countersink the upper holes where the hinge for the trim tab will go. I set up my countersink cage with my piloted countersink to get these done. Here is where I made a small error. Since the spar is .032″ thick material, and the holes have to be a little deeper to accept the dimple of the skin, I forgot that it may open the hole a little more which will allow the pilot to no longer center and cause chattering. That is what happened on the first hole. Once the hole was opened up larger than the pilot, it made a real mess of the hole. The pilot was able to wander all over. Some may say that the larger hole is a real problem. Traditionally yes it would if the spar being countersunk and the skin were the only parts being riveted together here. However, eventually the trim tab hinge will be added underneath, and this spar will be sandwiched between the hinge and the skin. There will be plenty of support for the shop head and the parts will lock together just fine. So how do you keep the pilot from wandering? I grabbed a piece of scrap sheet stock and simply matched drilled it to the spar and clecoed it to the spar so that as I cut the material out of the spar hole, it still had a good hole for the pilot to continue to hold the cutter solid. This worked great for the rest of the holes that had to be countersunk. Once the holes on the top were done, I dimpled the rest. As for the first chattered hole, I decided I would finish the rest of the hole prep and then decide what to do with this one. As I was dimpling the underside of the spar, I missed a hole with my dimple set in my pneumatic squeezer and punched a hole bigger. At this point, I decided it was time for a new rear spar. As cheap as the parts are for the tail, it was an easy decision. The rest of the night, I deburred, dimpled, and prepped the rest of the skeleton parts for primer. I did not dimple the skin tonight but will in the next build session. I also added a 3/8″ hole in the E-702 spar just below the hole for the jack screw for the trim screw. I did not like the idea of the trim servo wire sharing the same hole with a piece of threaded rod. 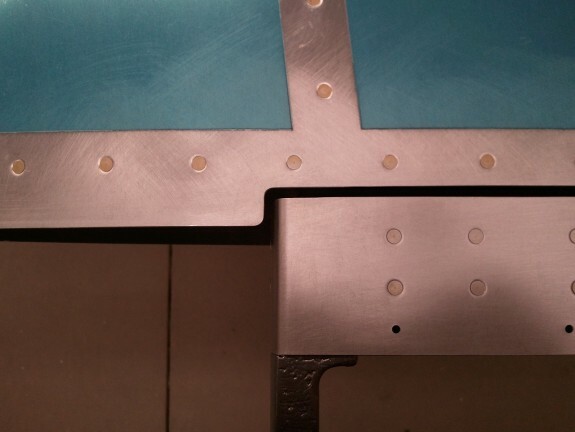 I centered the hole between the existing hole and the flange of the spar. It sits exactly centered with the existing hole as well. I think this will be a better way of routing the wire. I got the idea from another builder and have been told that no strength will be lost with a hole of this size here. Both holes will get snap bushings down the road. It was now time to close up shop for the night and order the new trim spar.